"Ranch dressing is so overpriced at the store, and it just tastes really fake to me. This one tastes more like the expensive kind in the produce department. 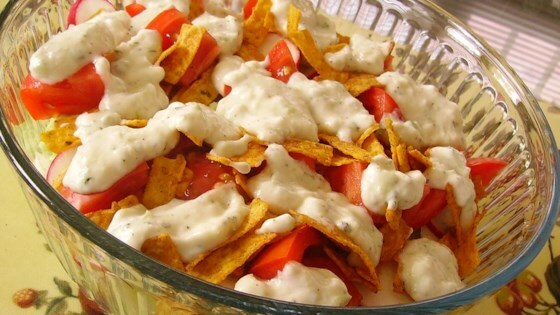 Made with yogurt instead of sour cream, you can eat it with a spoon and not feel guilty." Stir the yogurt, mayonnaise, green onion, parsley, pepper, salt, and Parmesan cheese together. Stir in milk to make it as thin as you like it, or leave it thick. Taste and adjust the salt if needed, adding either more cheese or more salt. Refrigerate for about an hour before serving. See how to make America’s favorite creamy salad dressing. This is very good as a dressing or a dip. The Parmesan, green onions, and pepper provide so much flavor that you won't even notice this is a lowfat dressing. This is a great dressing on the Spinach tortellini salad.